Our under-23s are at Charlton Athletic this afternoon in what is our final game in this season’s Professional Development League, and we have been given a final chance to claim a top two place with Birmingham City losing yesterday at Bristol City. The league has changed since yesterday. With Birmingham losing, Crewe have now sneaked into second place having beaten Colchester. They currently sit two points clear of both us and Birmingham although they have now finished their fixtures. That means we have to win at Charlton and then hope that Birmingham, who have a goal difference that is better than ours by four, fail to beat Hull this Friday in their final game. Charlton will be fielding two first team players in the game, but two first team players who are returning from long term injuries. Jake Forster-Caskey picked up a serious knee injury in pre-season and hasn’t played since. Lewis Page is also expected to feature having not played since October. Burnley, I’m sure, will have an inexperienced side out other than potentially goalkeeper Adam Legzdins who has played in a number of the under-23 games this season. 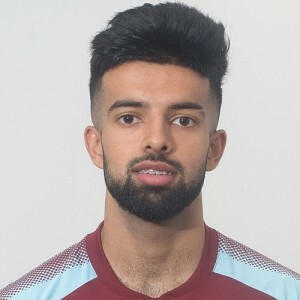 This fixture last season was also played away and ended in a 1-0 win for Burnley with our goal scored by Rahis Nabi (pictured). This afternoon’s game is being played at The Valley and kicks off at 1 p.m. Any Burnley supporters in the area will be able to attend. The lower West Stand is open and it will cost £3 adults, £2 concessions and £1 juniors. UPDATE: The Burnley team is: Aidan Stone, Jordan Cropper, Bobby Thomas, Scott Wilson, Anthony Glennon, Tunde Bayode, Mark Howarth, Trialist, Cricky Conn-Clarke, Rob Harker, Dan Agyei. Subs: Kai Calderbank-Park, Teddy Perkins, Vinnie Steels, Tinashe Chakwana.